Sunny in CAL: So Flattered! A few weeks ago, Erica nominated my blog for a Liebster Blog Award. I did thank Erica via email, but didn't have time to do a post until today. Erica, please forgive me for my delay. Then on Friday, Karen nominated me too! Charise at Charise Creates just blows my mind. She is such an amazing paper piecer. She creates her own paper piecing patterns that leave me speechless. Check out her ski chalet. It make you want to take up skiing even if you live in Hawaii. Melissa at We Shall Sew is one of the sweetest people I've met. I met her very briefly when I first joined the LAMQG. Now, she runs the Front Range Modern Quilt Guild in Colorado. 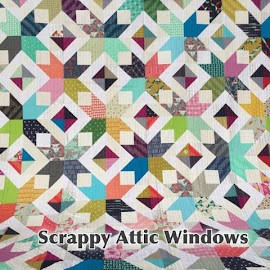 Her awesome 'TNT' Hexie Quilt was recently featured in Apartment Thereapy post on 10 Modern Quilting Inspirations post. Tanya at Free Range Quilting is a friend, guildmate an awesome long armer. Check out some of her personal quilts. Here's one she did for Maria (M Press Blog - mentioned next). I highly covet each one! If you are looking for a long armer, she's definitely your girl. Maria at M Press Blog is one of my BFF's in real life. I met her at work in 1996. She's is a Grammy ( not a typo! Yes, Grammy!!!) nominated graphic designer who loves to do a little letter press too. Her work is top notch and she quilts too. We lost touch for a bit , but reconnected through facebook. We've been inseperable ever since we found out that we both quilt and love fabric. I hope you check out these lovely ladies when you have a moment. 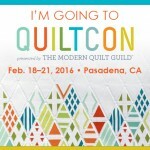 They are great people and great quilters too. I wish all of you a wonderful Easter. I saw this last week, but haven't spent much quality time on the computer, as you might imagine, since the birth of the little man. I'm not too good with updating my blog, and I have to really make an effort because I prefer to spend my time making stuff, but I love yours... it's so so cute.